New, innovative company destined to grow rapidly and set trends in the sports nutrition industry with exciting, unique products. IFBB Pro Anth Bailes and the formulators have an abundance of experience in the sports nutrition industry at both a manufacturing level and grassroots level. Keen to work with both small to medium to large sized businesses on a personal level, to cross-collaborate with marketing ventures across all the popular social media channels in a way that is mutually beneﬁcial for both companies. Committed to fair trade and building relationships for the long-haul. We don’t plan to be another ‘rinse-and-go’ sports supplements company. We’re in it for the longevity factor, just like you are. Experienced in both the e-commerce as well as bricks-and-mortar retail trade, having been part of numerous successful ventures in both sectors beforehand and able to assist you in the promotion of our products. Our wholesale and drop-shipping departments can help businesses to expand their product range and offer improved services to clients. From occasional orders to complete order processing outsourcing, our team have a wide range of experience working with trade customers of all shapes and sizes. Through constant improvement and innovation, some of the largest brands in the business are choosing to work with, and continue working with, MaxxMuscle 100% Or Nothing™. 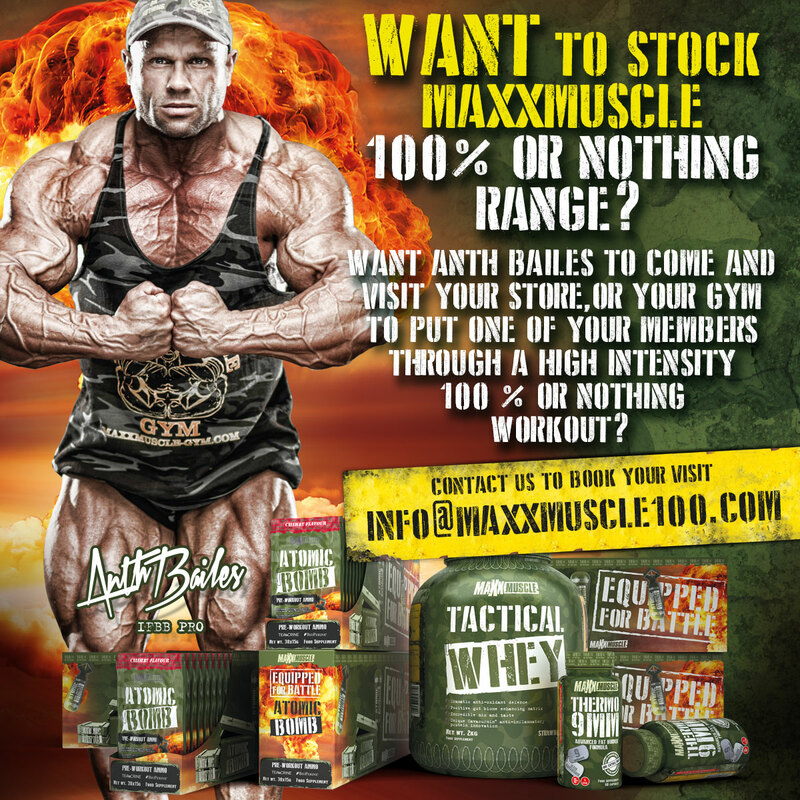 As well as supplying supplements directly to the end customer, MaxxMuscle 100% Or Nothing™ has a wholesale division supplying other websites, shops, gyms, and other trade customers. We can offer competitive pricing and outstanding service to all our trade customers and offer a guarantee that all orders received before 4PM are delivered on a next working day basis.